“Hazard Hamlet”, Modeltech’s flagship Electrical Safety Awareness display has recently celebrated its 25th year on the market. Now several generations later, the original version of Hazard Hamlet was first commissioned in Canada by Hydro Quebec then later by Hydro One (formerly Ontario Hydro) and Nova Scotia Power. Aimed at communicating the numerous electrical safety hazards in a typical community, Hazard Hamlet has been extensively used in North America and has since become the gold standard in Electrical Safety Awareness training displays. Today, there are six (6) different versions of Hazard Hamlet and the “new generation” models feature significant improvements in both video and audio content. The rising concerns in the early ‘90s over the increasing number of fatalities due to electrocution was the driving force behind the creation of the Hazard Hamlet table top display. Still today, more than 500 people per year are reportedly killed and many more are injured in North America in electrical accidents. This excludes the large number of workers who are either killed or maimed by electricity on the job. Boom trucks, ladders and even kites represent a potential mortal danger to humans when working or playing in and around electricity. Contact with overhead and buried wires outdoors are still a major safety concern today, but there are also several in-home electrical safety worries that both children and parents must be made aware of. Safety training is still something that has to be demonstrated dynamically to transfer concrete facts to the public (young and old) and achieve maximum memory recall. Modeltech simulators take the risk out of “live training” but keep all the drama and action in the presentation. No single website or demonstration video display has the same audio/visual impact than a Modeltech display. 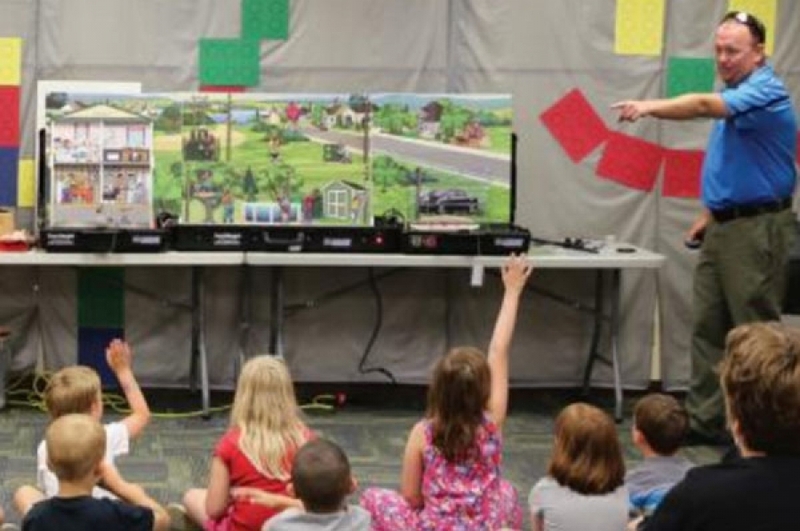 Kids and adults alike are still to this day fascinated by the interactive nature of a presentation using our “state-of-the-art, old school” electrical safety display. For more information on our complete line of Electrical Safety Awareness training displays, visit our safety demonstration products page or contact us today at 1 800 686-8009.